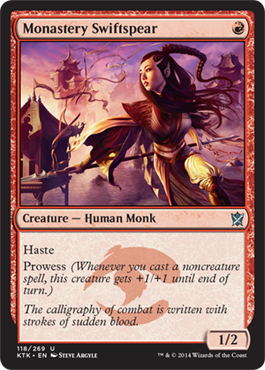 For the second day of this week, we're going over the Jeskai clan and some cards to look for and play in the Fate Reforged prerelease this weekend. What? 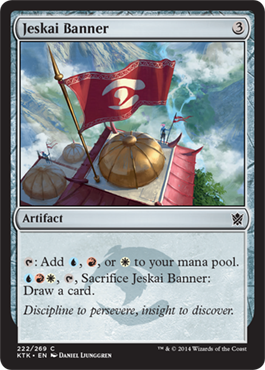 There's nothing that says Abzan cards can't be in a Jeskai deck... 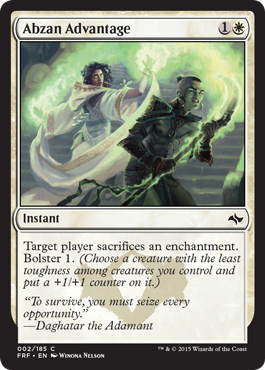 Besides, Bolster and forcing an enchantment to be sacrificed could be useful, especially in the control aspect of the Jeskai. Aven Skirmisher is here because of evasion and the cheap cost. 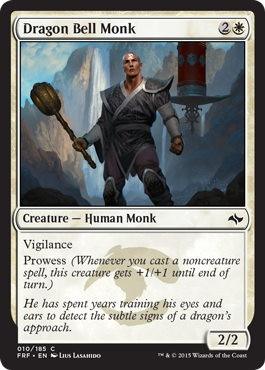 Dragon Bell Monk, like mentioned yesterday, has both Vigilance, Prowess, and is an overall great card for limited. Draw a card and tapping a creature. Definitely good. 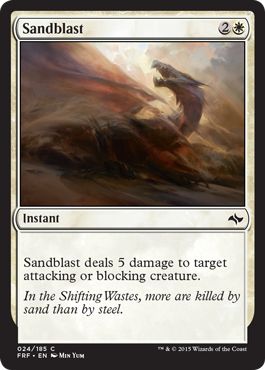 Sandblast being direct damage is pretty useful. 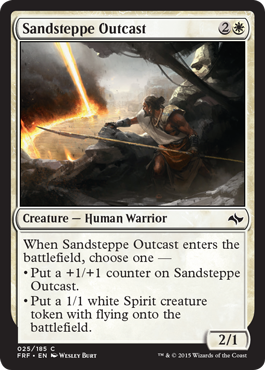 Sandsteppe Outcast is useful because of the options. Being able to have one thing over another depending on the situation is great. I'm a fan of the Runemarks if you couldn't tell after yesterday. 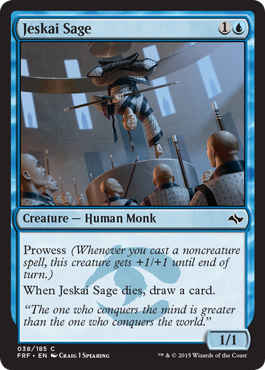 Jeskai Sage works into the control side of things in that you can draw a card after it dies, it's cheap, and you can boost it by casting spells. 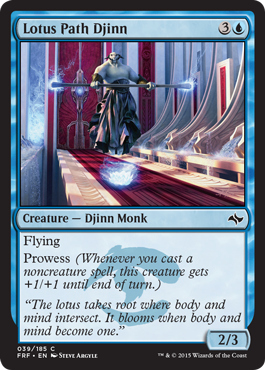 Lotus Path Djinn pairs Prowess with an evasion mechanic allowing you to win. 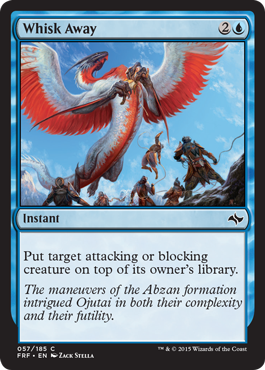 Control plays the long game and has creatures difficult to damage or defend against and flying does just that. 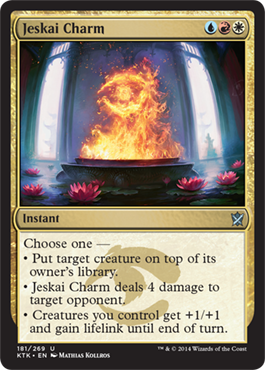 Counter spells are important to the control aspect and Rakshasa's Disdain should work well against any deck, except those playing Sultai... Refocus is the opposite of Pressure Point and allows you to untap a creature to block with and gain some card advantage. Seems good. 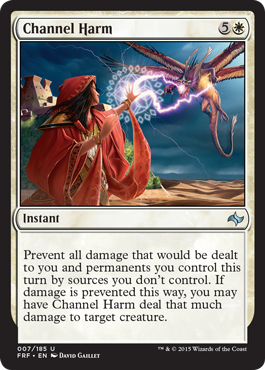 Whisk Away... well, as a person who likes cooking, I have an alter in mind for this art but that's not about Limited... Again, control requires spells such as this to keep the other side of the field clear. Bathe in Dragonfire helps clear the board. A bit costly to cast, but potentially worth it. 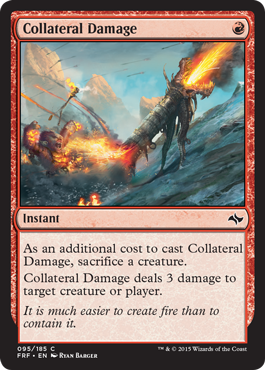 Collateral Damage is our new Lightning Bolt and will be used for such, especially with Jeskai given Jeskai Sage giving you a card for it dying. So there's that... And now, the one common dragon. Five mana for a 5/5 is great. Then flying, trample, and haste is great too. And then we get the catch... It has to go away at the end of your turn and will return sometime in the future. Runemarks, everybody! 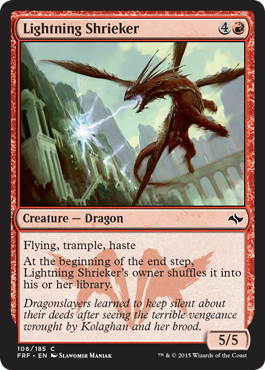 And now... Temur Battle Rage. Ignore Ferocious for a second. Casting this triggers Prowess. 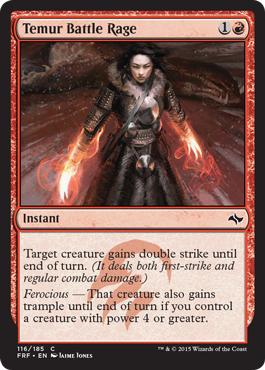 Double strike on a creature with Prowess makes this a great card to use. If you fit the Ferocious category, even better! Four damage and card draw for five mana. Not bad, but definitely good for Limited. 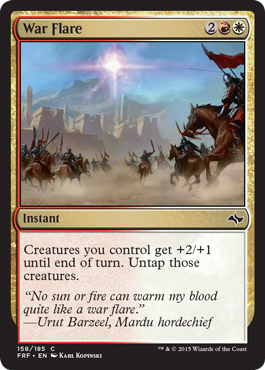 War Flare not only triggers Prowess, but it adds a boost on top of that. 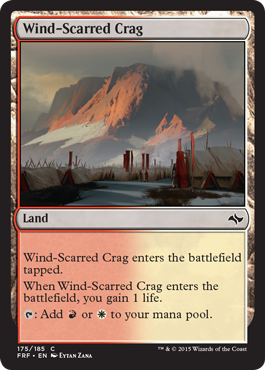 If you can pop off one of those along with Temur Battle Rage, you have a good chance of winning. Want a deck with more than one color? 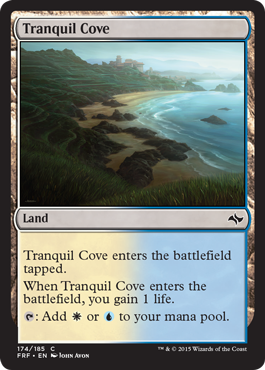 Fix the mana with dual lands. 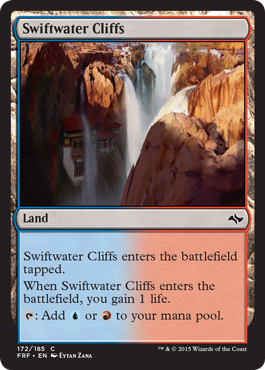 Sure they're slow out of the gate, but you gain a life the turn you play it and then have options on mana colors from then on. An expensive Fog, sure, but you can send the damage right back. 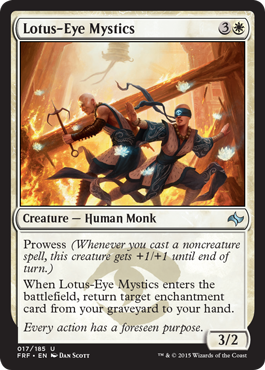 Lotus-Eye Mystics has Prowess and can return an enchantment from your graveyard to the battlefield. 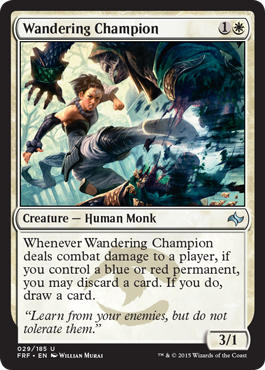 And then Wandering Champion allows you to cycle through your deck. If your hand is land heavy, this can come in handy. 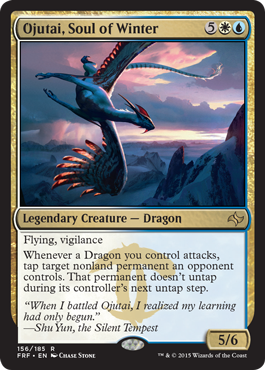 Fascination is great for Commander, but we're here for Limited! 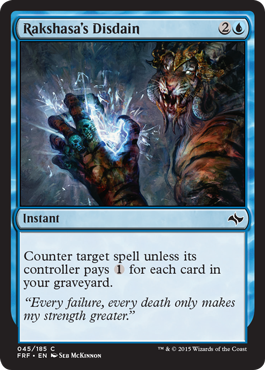 Honestly, for Jeskai, card draw is useful. 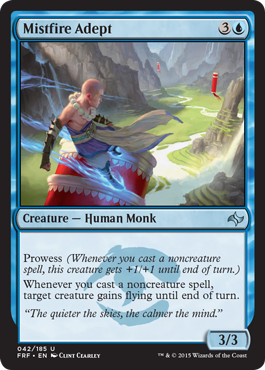 If you run more cards, milling works too, especially if you can mill both your opponent and yourself your turn forcing them to draw into nothing and lose. Mindscour Dragon can help with milling too! And then there is the 3/3 with Prowess. 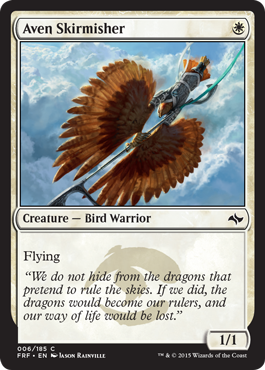 And when Prowess triggers, you can make a creature fly. Seems good. 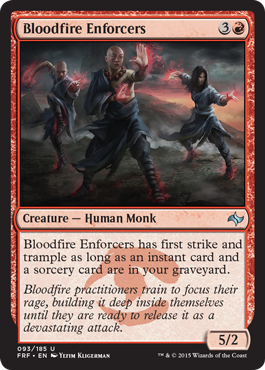 Jeskai being control centric, Bloodfire Enforcers will easily be able to have first strike and trample. 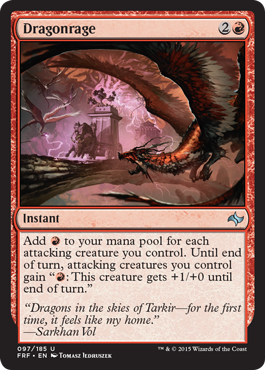 Dragonrage is good, because while you have fewer creatures, it triggers Prowess and allows you to boost each creature even more. 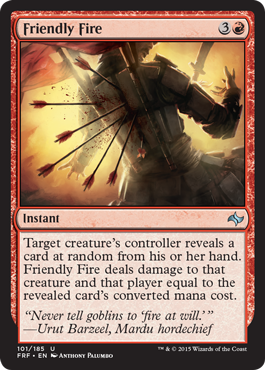 And then Friendly Fire is pretty cool because you can possibly wipe out one of your opponent's creatures. 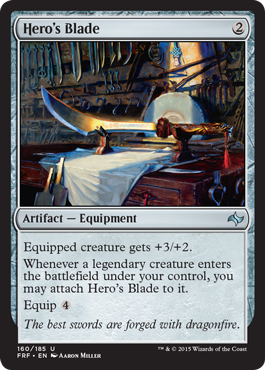 Hero's Blade, like I mentioned yesterday, is great even if you don't have a legendary creature in your deck. Pilgrim of the Fires is a decent fatty. 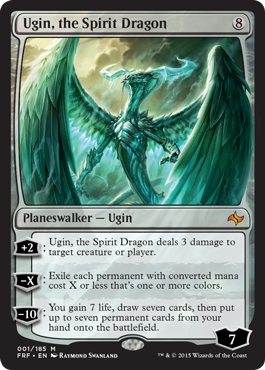 Well, uh... Ugin because why not? 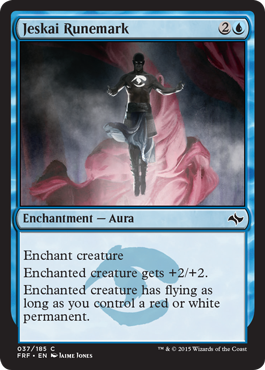 If he was colored, he'd be Jeskai. 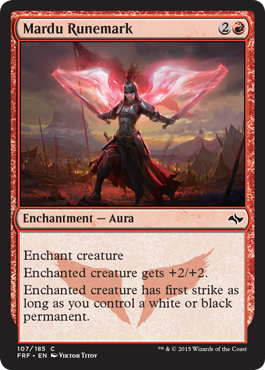 Life gain, direct damage, exiling creatures, drawing cards. 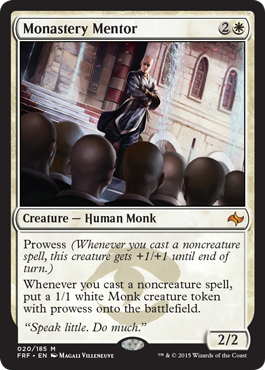 Very White/Blue/Red to me... Monastery Mentor has Prowess and generates tokens with Prowess. Pretty sweet. 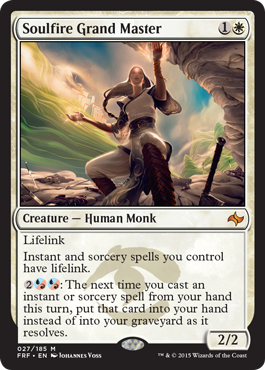 And Soulfire Grand Master, lifelink, direct damage spells have lifelink as well, and your spells become boomerangs if you pay the cost. 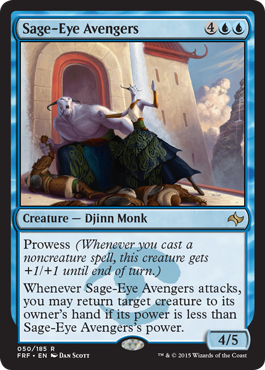 Sage-Eye Avengers has evasion because it removes a creature when it attacks. 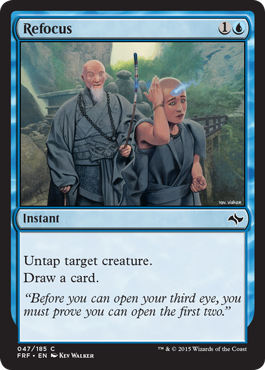 Shu Yun having Prowess and being able to hand out double strike when Prowess triggers is pretty good too. Mob Rule lets you steal creatures. Seems good for a control centered clan. Tapping down permanents is pretty useful with Ojutai. 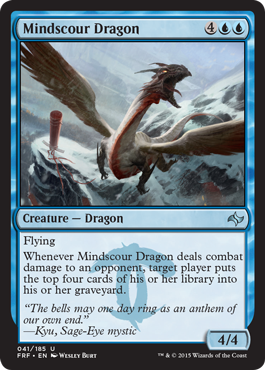 Paired with the four other dragons available in Jeskai colors, you can lock down a lot of your opponent's creatures. 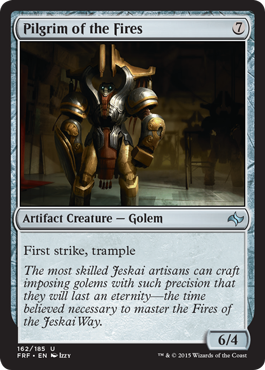 Scroll of the Masters is built for Jeskai. 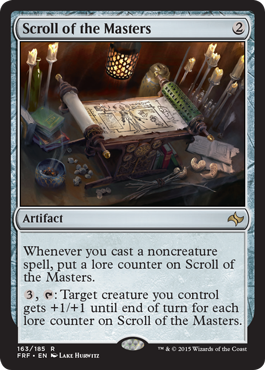 "noncreature" is the important piece to Prowess and being able to boost your creatures by use of a rebate of sorts you've stored up from all those noncreature spells could really help out. 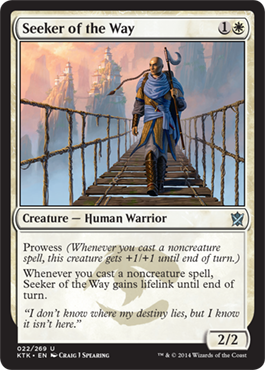 Seeker of the Way gets lifelink when Prowess triggers and it's a 2/2 for two mana. Pretty good. Suspension Field is great too for removing threats. 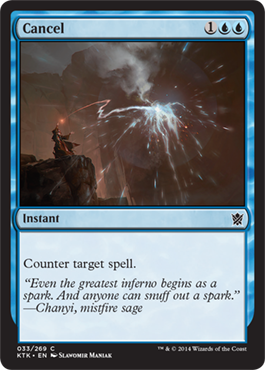 Cancel is an important counter spell in any format if you're playing control. 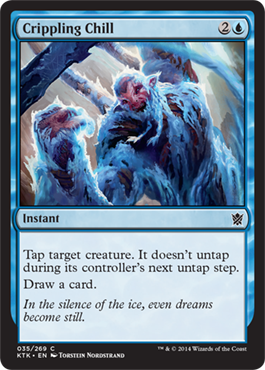 Crippling Chill locks down a creature for a couple turns and you get to draw a card. Seems pretty good. 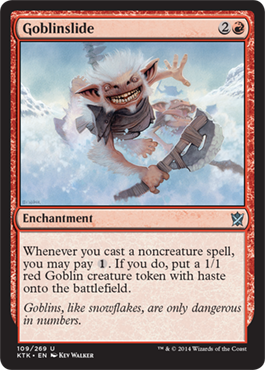 Goblinslide triggers whenever Prowess triggers and gives you more creatures. And Monastery Swiftspear... Haste and Prowess. 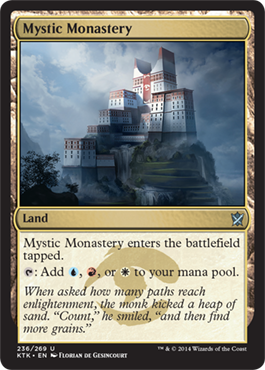 It works great in Modern. Limited may not be as great, but haste! 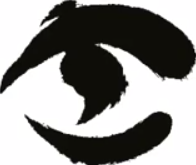 I like more than just Runemarks. I like Charms too, especially given the options available. You have control, burn, and lifegain. Can't be beat! And then we have two good methods of mana fixing in KTK Block limited. 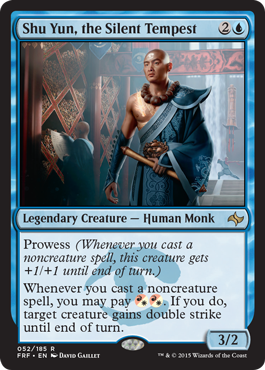 Join me again tomorrow for a foray into the Sultai clan and cards to look for if you choose to join them at the prerelease!